Bonus: it also happens to be good for your skin. Something about the forgiving nature of an oversized cashmere sweater makes us want to eat. A lot, and often. And while we are hungrier than usual, we’re also trying to stay healthy, which is why we’re turning to L.A.-based nutritionist and author, Shira Lenchewski for a little advice. 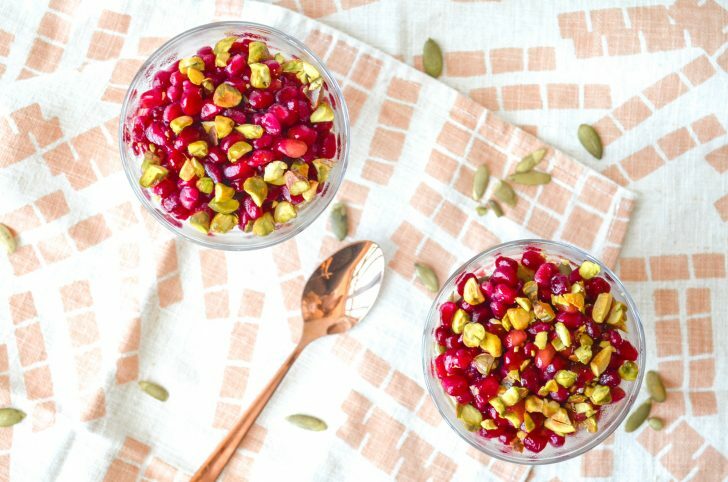 We first became fans of Shira via her gorgeous Instagram, and have since followed her, oh, everywhere else possible, and couldn’t resist getting a fall recipe from her that’s comforting and indulgent-feeling, but also still really, really, ridiculously healthy—all featuring one of Autumn’s culinary stars, the pomegranate. Our yearly fall produce upgrade comes with some real gems, not the least of which is the pomegranate. 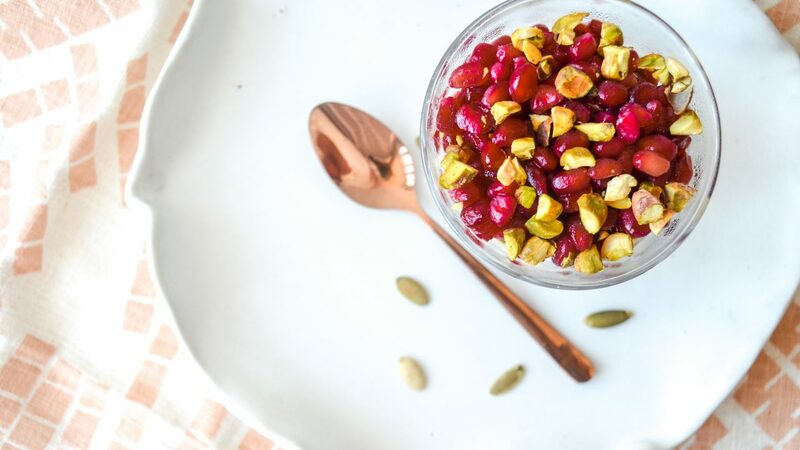 There’s a lot to love about this strange-looking fruit and its tart little ruby seeds, especially when it comes to the quest for healthy, dewy skin. Pomegranates are loaded with badass antioxidants (anthocyanidins, ellagic acid, polyphenols and flavonoids) which are essential for preventing oxidative stress in the body, and trapping free radicals that can damage DNA and RNA. This includes slowing down the effects of aging by protecting against environmental damage to the skin. The juice contains punicalagins, antioxidant compounds that have been found to inhibit enzymes that degrade collagen, thereby promoting skin elasticity. Pomegranate seed oil is loaded with punicic avid, a VIP fatty acid that assists skin cells in locking in moisture. 1. Drain the cashews and transfer to a blender or food processor. Add in the water, maple syrup, vanilla extract, and sea salt and blend until smooth. 2. 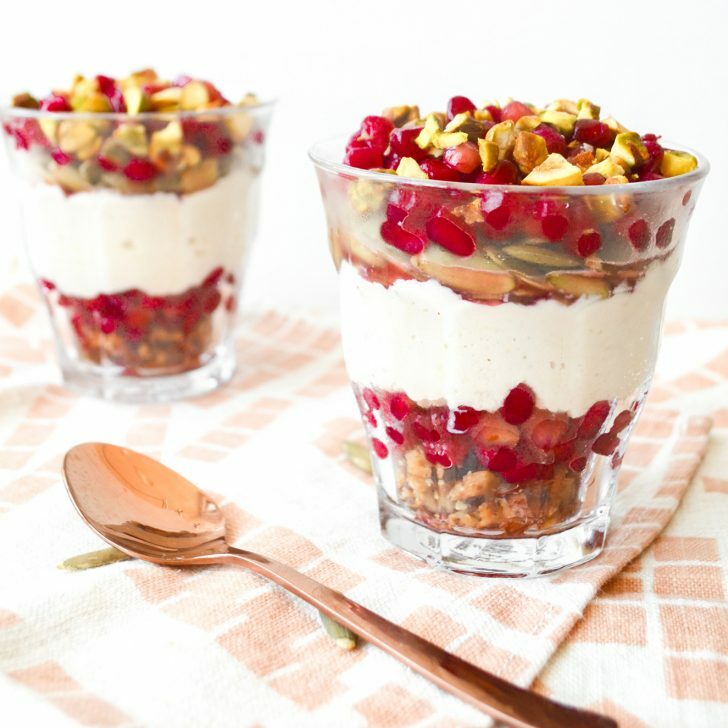 Create layers of pomegranate seeds, pumpkin seeds, pistachios, walnuts and cashew cream in a small cup.